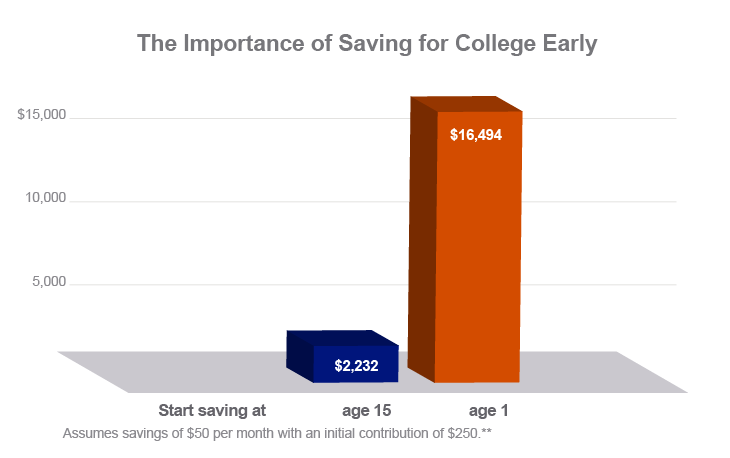 It's never too early or too late to start saving for college. Here’s why you should start now. College savers become college students. Time can work for you. Starting early can make a big difference. Saving is better than borrowing. 1Elliott & Beverly, The role of savings and wealth in reducing "wilt" between expectations and college attendance; Journal of Children & Poverty, 2011. 2College Board: Trends in College Pricing, 2013. 3A plan of regular investment cannot ensure a profit or protect against a loss in a declining market. 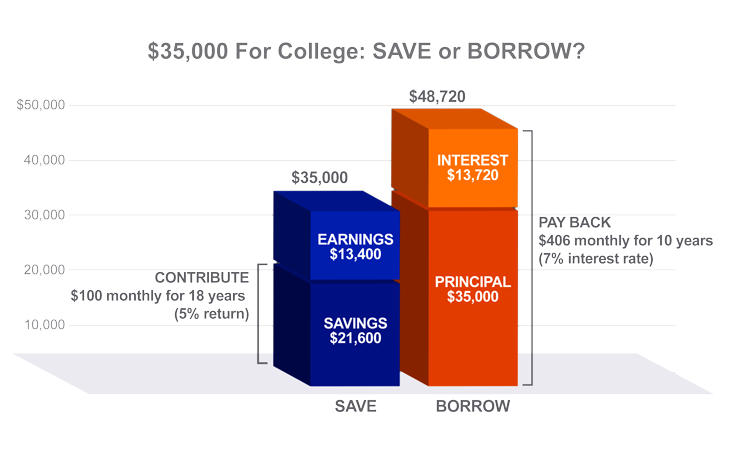 4The hypothetical example assumes college begins at age 18 and is based on a 5 percent rate of return compounded daily, and is for illustrative purposes only. It does not reflect an actual investment in any particular 529 plan or taxes, if any, payable upon withdrawal. 5This hypothetical example is for illustrative purposes only and assumes no withdrawals made during the period shown. It does not represent an actual investment in any particular 529 plan and does not reflect the effect of fees and expenses. Your actual investment return may be higher or lower than that shown. The loan repayment terms are also hypothetical.